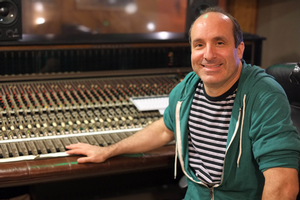 Jonathan Pines, owner of Private Studios, Urbana, IL has been making records for more than 25 years. He is a committee member of the Recording Academy P&E Wing, and an AES Presenter and member. With over 15 million records sold, he has recorded a diverse group of artists including Adrian Belew, Eminem, Wilco, Alison Krauss, I Fight Dragons, Gin Blossoms, Champaign, Luther Ingram, and Menthol. Since 2010, he has been the Director of Strategic Operations for Rupert Neve Designs and Fingerprint Audio [sE Electronics]. Jonathan has expanded both companies endorsees to include Engineers, FOH, ME and Producers working with live and in the studio with Linkin Park, Madonna, Black Sabbath, Paramore, My Morning Jacket, Keith Urban, Tom Petty, Band of Horses, Dapkings, Kings of Leon, Floggin’ Molly, KC Tungstall, Rusted Root, Motely Cru, Bob Dylan, Justin Timberlake, Godsmack, Papa Roach, and Jay -Z just to name a few. He consults for industry and studios while continuing to record new and established artists including [recently] hosting mixdowns of Hip Hop top artist G-Eazy's upcoming release, and working on records for hot Nashville Producer Ken Coomer [Wilco], and Nashville super engineer and multiple grammy winner- Neal Cappelino at Private Studios. Jonathan lectures and presents at the AES, The Recording Academy, BADASS, CRAS, CIASW, Potluck, and other industry and educational events.